OK, I decided to do a random one, so have fun! Puplet, the Puppy Pokemon, is quite small and enjoys playing with other Puplet and Growlithe, but, like Growlithe, has a fiercely territorial side, but times that by 10, and is quite smart to the point where if they see certain markings on people’s clothing, like Team Rocket or Team Flare, they will attack very fiercely. Puplet is a Fairy/Fire type. Pupcanog, the Firebite Pokèmon, unlike their pre-evolution, and while they do get along with Puplet, Growlithe, Arcanine, and other Pupcanog, they are very aggressive towards other Pokemon, especially what it is weak to, but it does give certain weak Pokèmon like Rattata and Zigzagoon, some leeway, sometimes even helping them out. This Pokèmon is quite aggressive but has a very soft side, it is also very large, weighing an average of 235 KG.It is a Fire/Dark type. Its 11PM when I am making these, Puplet is based on my dog Zoey. I dunno why I made this. 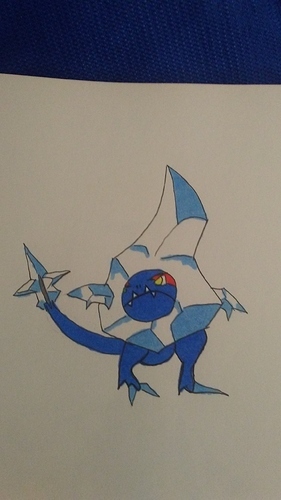 Sharcicle are super rare Pokemon who inhabit some of the coldest and most remote locations on the planet. Since they see so few humans, they are very curious about them and will hide among real icicles to observe them. Should they be discovered, a Sharcicle will most certainly run due to their paralyzing fear of being broken. Due to their fragile nature and shy demeanor, Sharcicle are extremely difficult to find in the wild. Sharcicle is an icicle. It’s name is a combination of the words “shard” and “icicle”. 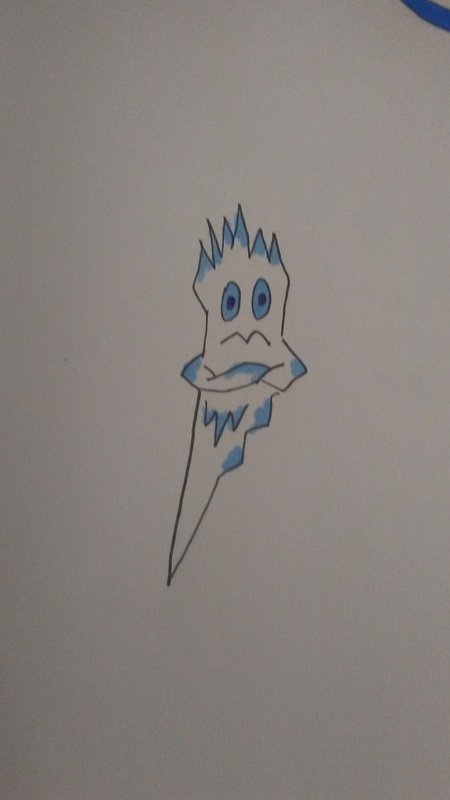 Since Sharcicle are so rare, Stalagamander are even rarer. Many scholars once thought that Sharcicle and Stalagamander were stand alone Pokemon who had nothing to do with each other. It was only recently that it was discovered that they are part of the same evolutionary path. Unlike Sharcicle, Stalagamander are not shy and in the rare event that you stumble across one, you will not soon forget the encounter. Stalagamander are very loud and rambunctious Pokemon who love nothing more than to be disruptive. Stalagamander have been known to purposely fall off of ice cliffs and on top of unsuspecting travelers. Stalagamader is a lizard creature encased in a chunk of ice. It’s name is a combination of “stalagmite” and “salamander”. Rarer still are Blizzaurus who were thought to be a myth for centuries. This is partially due to the remote and solitary locations that they choose to live in, and partially due to their propensity for attacking anyone who sees them. Fiercely private, Blizzaurus won’t even allow other Blizzaurus in their vicinity. Blizzaurus have sharp claws and tremendous strength, but their most brutal weapon is their tail. Armed with over ten sharp ice spikes, their tail has been known to cause avalanches or knock out a foe in a single swipe. Blizzaurus is a bipedal ice dragon creature. 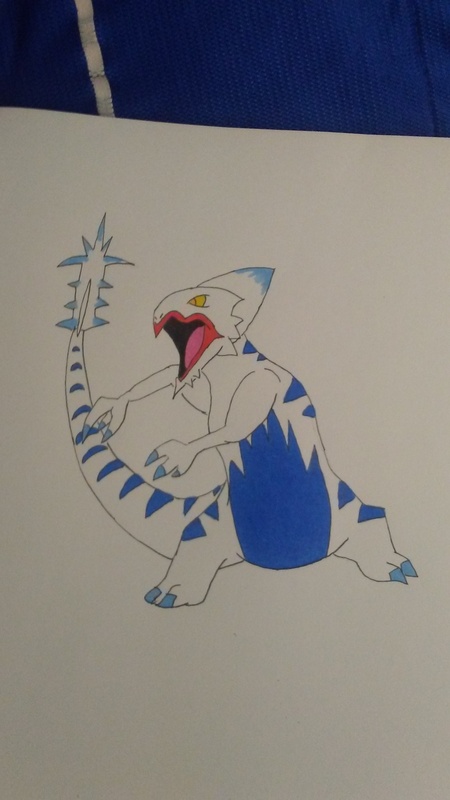 It’s name is a combination of “blizzard” and the common dinosaur suffix “-saurus”. It is considered a pseudo-legendary Pokemon. I have also now shared 81 from my dex! Rhiwool are friendly and common Pokemon who frequent arctic areas. Traveling in large herds, Rhiwool are constantly migrating from one location to another, rarely staying in any one area for more than a few days. Despite usually living in more desolate areas, during winter months Rhiwool migrate south to human populations. This time of year is usually called “Rhiwool Season” due to how common they become in these areas. 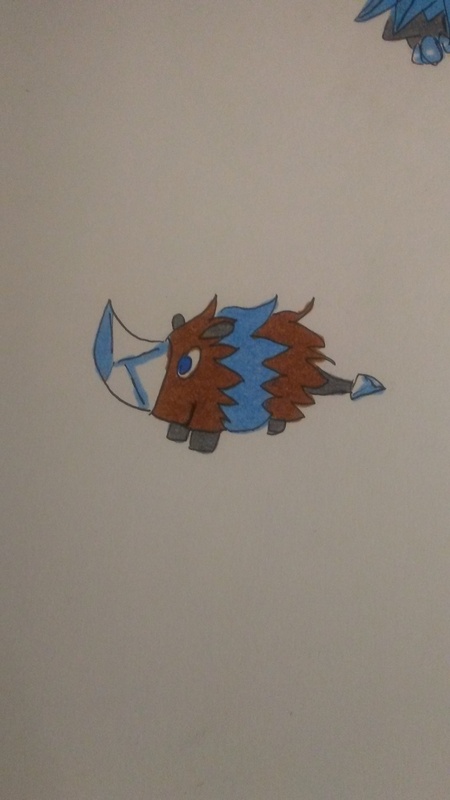 Despite being an Ice type Pokemon, their horn actually generates heat. Rhiwool is based on a baby prehistoric woolly rhino. It’s name is a combination of “rhino” and “wool”. Eventually, a Rhiwool’s horn will generate more and more heat, causing it to crack when they evolve. This gives Oppoceros a horn that not only is an effective physical weapon, but also allows it to launch explosive fire attacks. Oppoceros are peaceful and docile Pokemon who make steadfast companions for trainers. Despite their kind nature though, they are very protective of their herd, Rhiwool, and their trainers. 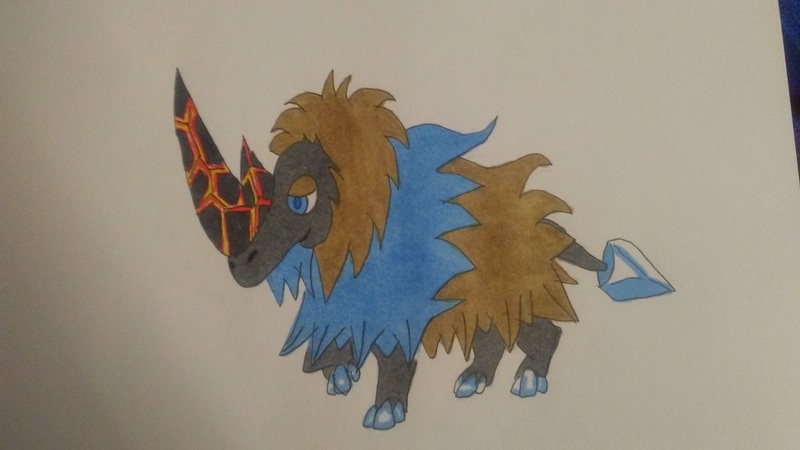 Oppoceros is based on a prehistoric woolly rhino. It’s name is a portmanteau of “opposite” due to their fire/ice typing and “rhinoceros”. Gonna post some more tonight, I think. Hauntom are small ghost Pokemon who like to hide, especially with other beings. Hauntom have been known to accidentally scare children who are playing Hide and Seek by appearing and trying to hide with them. Legend has it that Hauntom are the spirits of those who died while hiding and were never found. 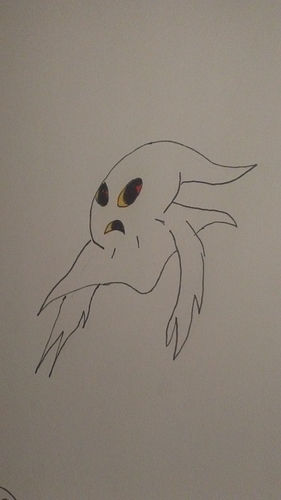 Hauntom is based off of a classic “floating sheet” style ghost. 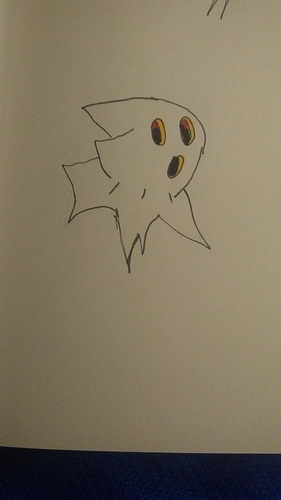 It’s name is a combination of “haunt” and “phantom”. While Hauntom enjoys hiding, Floatasm has an obsession with seeking. Floatasm will do what it can to flush anyone they can out of hiding. This is not as innocent as it seems as it is dangerous for Pokemon who are trying to hide from predators. A Floatasm will cackle wildly when it succeeds, flying in circles as a predator enjoys it’s assistance. 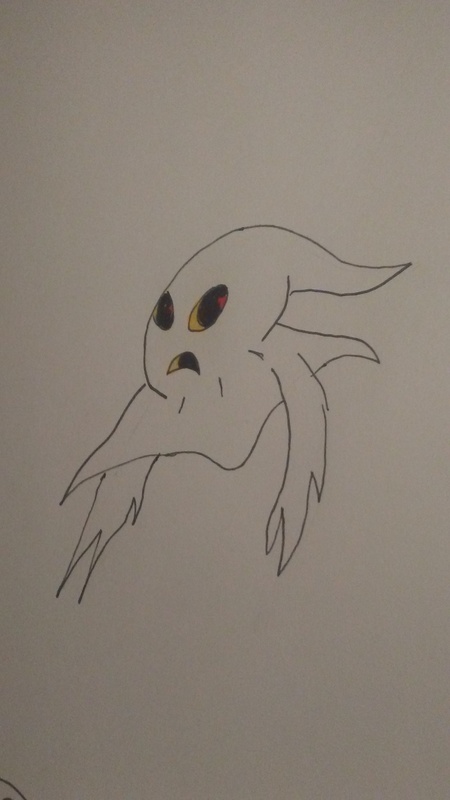 Floatasm are also based on a classic “floating sheet” style ghost. It’s name is a combination of “float” and “phantasm”. Reveclang has no interest in hiding or seeking. Reveclang are predatory Pokemon who like to clang their chains to attract prey. Reveclang like to find large groups of travelers to see how many they can lure away by making sounds in the night, picking them off one by one. It is said that if you hear an odd sound in the distance or in another room, you should think twice before investigating as it just might be a Reveclang. 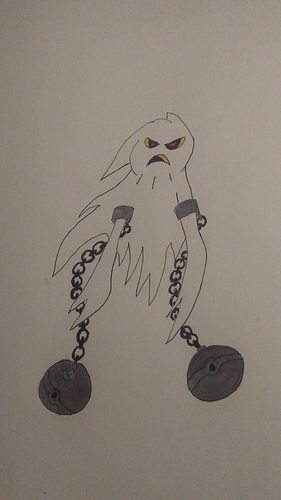 Reveclang is also based on a classic “floating sheet” ghost, but with chains. It’s name is a combination of “revenant” and "clang:. Working on a new one right now. Shaleback are very rare Pokemon who can only be found hidden on remote islands or in safari zones. Shaleback move very little and spend their entire day either sleeping or basking in the sun. Making them even more difficult to find is their ability to go inside of their shells and appear to be a simple pile of rocks. 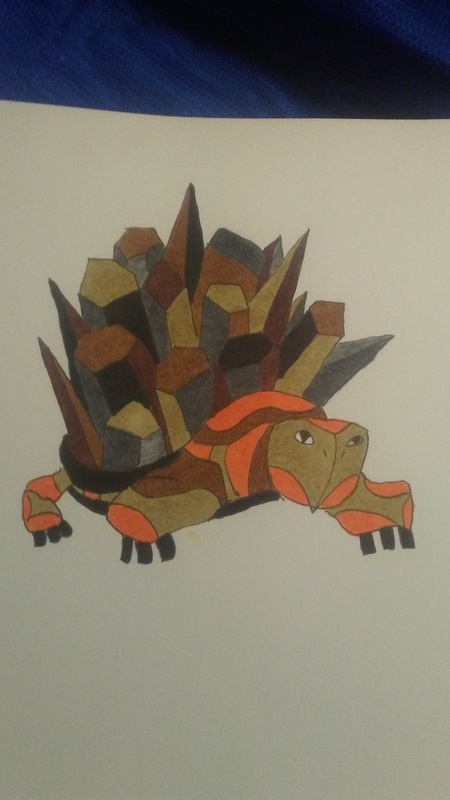 Shaleback are based off of a turtle. It has the lowest speed stat in my entire dex. Also only found on very remote islands, Citashell are living fortresses who are nearly impossible to injure. Living in small communities, Citashell can spend days inside their shells, appearing to be a large rock formation. Rarely moving unless they have to, Citashell are fiercely territorial. In the rare event that a trainer stumbles across them in the wild, it has been reported that it was difficult to tell just how many attacked them since they are hidden among the mountainside. 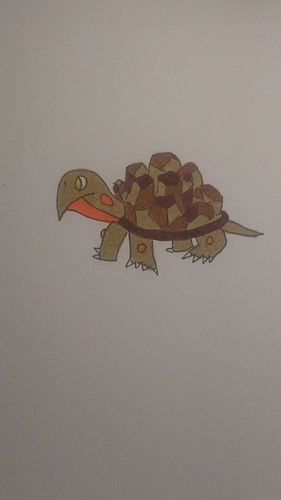 Citashell are based off of large island turtles, namely a Galapagos turtle. Their name is a combination of “citadel” and “shell”. Their name also rhymes with “citadel”.